Stress-Relieving & Aromatic Handmade Soaps, Bath Salts, Herbal Bath Tea Bags, Massage Oils, Salt & Sugar Scrubs, & New England Dream Pillows.
" State of NH Soap Set " is our featured soap this month. Enjoy the aromatic scents of NH Lilac and NH Balsam in this unique set. 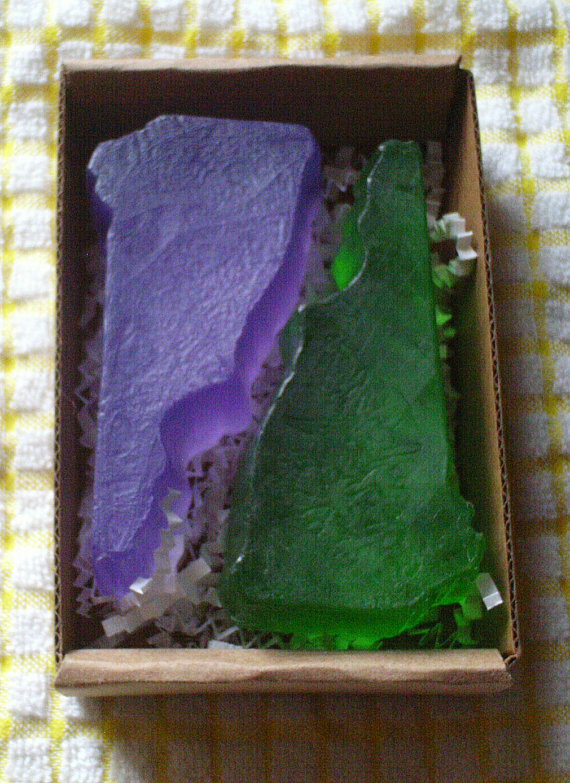 The soaps are in the shape of the State of New Hampshire. They are made with Glycerin which mositurizes your skin. Our Soaps are made with Glycerin, Goat's Milk, Honey, Aloe & Olive Oil, Hemp Seed Oil & Shea Butter. Our products are sold at the Valley Artisans (Epsom), WRENovation (Bethlehem), and online on my Etsy shop. Dear Me Suds Homemade Soap & Co.